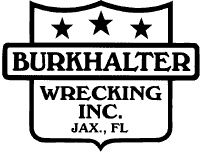 BURKHALTER WRECKING INC is dedicated to providing it's clients with services that incorporate the highest degree of reliability and experience. Since July of 1966, when we were incorporated, our goal has been to treat each demolition project, residential or commercial, in a safe and timely manner, selectively choosing items of architectural interest for distribution via our sales yard. Our work will comply with current and future standards as set forth by government regulations. Whether multi-story buildings, commercial sites, warehouses, single family homes or even pools. We have the expertise to do the job. For over 80 years we have been saving usable materials from the buildings that we demolish. Come see the selection of architectural salvage that we have to offer. Let us be a part of your next project.